All new promotional video for the upcoming OPPO F5 Smartphones shows up online taunting the rather impressive 6-inch Full-HD+ 18:9 display. 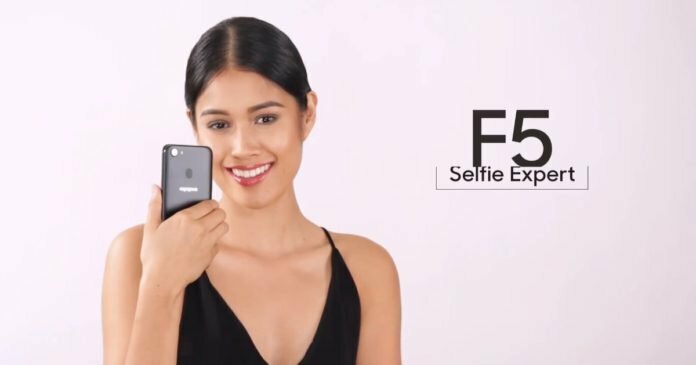 The device appeared on ABS-CBN Lifestyle, which shows models taking selfies with the handset. The video has also revealed the design of the OPPO F5 from all angles. PromoThe promo video of the OPPO F5 has confirmed that the phone will come with a nearly bezel-free display with an aspect ratio of 18:9. The phone will have narrow bezels on the sides and slim bezels on the top and bottom. While it’s not visible in the video, the device will reportedly arrive two cameras on the front for clearer selfies. It appears that the phone will come with a premium all-metal unibody design and a fingerprint sensor that will be located at its rear. Its antenna bands will be located on the top and bottom edges at the back panel, and there will be a single primary snapper with an LED flash unit. According to the earlier reports, the OPPO F5 will feature a 6-inch full HD+ 18:9 display, and will boot the Android Nougat-based Color OS. The phone is expected to be powered by a Qualcomm Snapdragon 660 processor, mated to 4GB or 6GB of RAM. The storage capacity on board is rumoured to be 64GB, which will likely be further expandable. The camera department is expected to include a 20MP rear snapper and a 16MP dual front shooter. A 4,000mAh battery is expected to keep the show running. OPPO hasn’t yet confirmed when it is planning to unveil the F5 at the moment. However, all the promotions and advertisements in the Philippines suggest that the device could be unveiled on October 26th. We will update you with more information as soon as anything pops up, so stay tuned.